Known for its idyllic location on the shores of Lake Como and at the foot of the Alps, Como is one of northern Italy's most popular tourist destinations. The town's rich history is reflected in its Roman structures and medieval atmosphere. The countryside, with impressive views of the lake, is dotted with elegant villas that serve as luxury vacation retreats. The traditionally quiet town transforms into a busy center of dining, shopping, and cultural activity during the summer months, when visitors come to enjoy the warm weather and beautiful lake. Como is in Lake Como. Add Como and other destinations in Italy to your travel plans using our Italy trip itinerary planner. Indulge yourself by booking a luxurious suite at a lavish hotel right on the shores of Lake Como. Pricey hotels and private villas may provide an ideal lakeside setting, but you can save money by staying at a B&B in the city of Como itself. The city is much less expensive than the resorts of the so-called "middle lake," but be sure to book early. 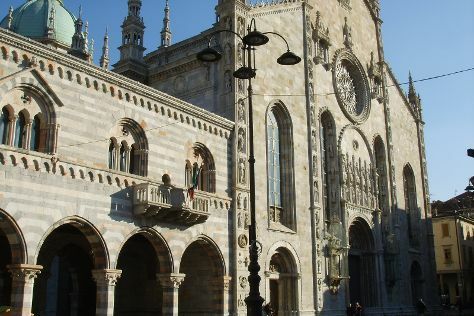 Even less expensive is staying in Milan, from which you easily access the lake district by train or car.